Letter of protest against the Graziani Monument by the main Associations of Italian Partisans, Deportees, and Resistance Movement. This is to inform you that recently, at the Casa della Memoria in Rome, the following organized protest against the Graziani Monument will be taken by the main Associations of Italian Partisans, Deportees, and Resistance Movement. 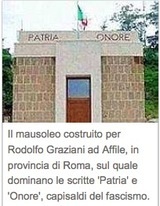 On August 11, 2012, the Municipality of Affile (Rome, Italy) unveiled a publicly financed memorial to General Rodolfo Graziani. This event made headlines all over the world, creating international shock and disconcert and discrediting Italy. In 1948, an Italian Military Court sentenced General Graziani to 19 years in prison for his collaboration with the Nazi under the short-lived Repubblica Sociale Italiana. Internationally, however, Graziani is mostly remembered for the atrocities he ordered in Italy’s African colonies, where the most heinous crimes were perpetrated under his command to repress anti-colonial resistance. In Libya, he set up concentration camps where thousands of Libyan civilians died. As a ruler of Italian East Africa (AOI), he repeatedly ordered summary executions against Ethiopian civilians. Graziani never paid for his crimes, since Italy never granted extradition to Ethiopia, and his actual state of detention lasted only two years. Graziani’s crimes are still an open wound in the collective memories of African peoples. To build a monument to Gen. Graziani is an open insult to the victims of his crimes. It also does not help Italy’s cause. A country with no historical memory is only destined to lose itself. Mr. President, as citizens and intellectuals all over the world who deplore the initiative of the Municipality of Affile (Rome, Italy) we appeal to the civic and democratic values you represent to exert moral pressure so that such a memorial may be removed and re-addressed to honour all those who have been victims of the colonial period and military occupation.